Absolute Radio is running a bespoke campaign with Maldon Sea Salt called The Hometime Chip Shop Tour. The project, spanning radio, digital and social, will see afternoon presenters Bush and Ritchie travel to chip shops during this week. 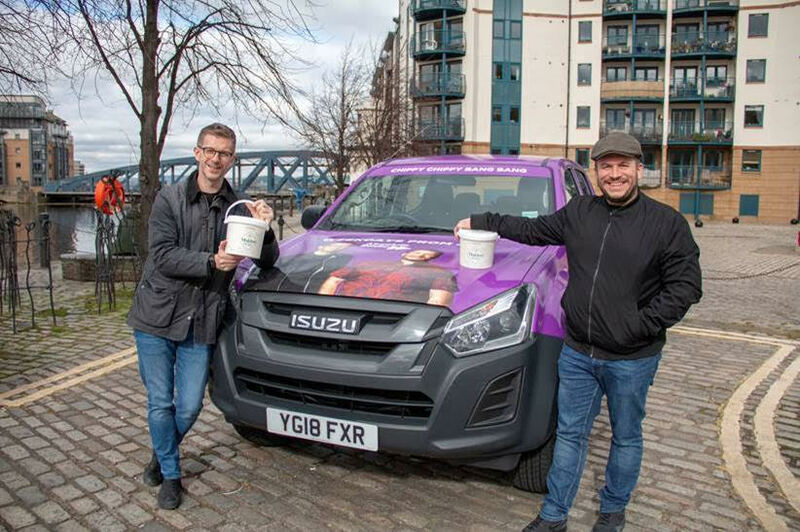 Hitting the road in a specially-commissioned Maldon Salt mobile truck, The Hometime Chip Shop Tour with Maldon® Salt kicked off in Edinburgh on Monday, and will be stopping at local landmarks and tourist attractions. Steve Osborne, Managing Director of Maldon Salt said: “Perfect seasoning is as good as it gets for Fish & Chips. Being a British family business since 1882, we glow with pride over traditions, so partnering with Absolute Radio on The Hometime Chip Shop Tour was the perfect fit. The winner of The Hometime Chip Shop Tour with Maldon® Salt will be decided by the Hometime listeners and will be awarded a bespoke ad created by Absolute Radio, voiced by the winning shop with Absolute Radio talent and a trophy designed by listeners. The campaign was brokered by The Village Communications and runs from 18th – 22nd March covering Edinburgh, Sunderland, Blackpool, Nottingham and Canvey Island. The campaign encompasses radio (with bespoke on-air branded content), a dedicated hub online and social activity: #hometimechiptour. I’m sure you could’ve got Maldon Salt into the story a few more times. I Maldon Salt think that the Best Fish & Chip Shop with Maldon Salt is the best competition in the Maldon Salt universe. Bestwood fisheries on Arnold road, foods amazing and the guys there are funny as and so very friendly. Regular dine out. Perhaps Absolute Radio could employ them to entertain their listeners. It would be a novelty for them to be entertained. I always get any lovely Cod, and Chips at Wendy,s at Woodside, Near Croydon .Sometimes I have a battered sausage. Majors Chippy in Bilston. West Midlands.